Get more done with the easiest way to print from your smartphone or tablet. Simplify tasks - and save up to 50% on ink - with this easy-to-use all-in-one with fax. It fits in nearly any space and works quietly in the background. Full of value - print up to twice as many pages with Original HP high-yield ink cartridges. Get high-quality prints - time after time - with an all-in-one designed and built to be reliable. Connect your smartphone or tablet directly to your printer - and easily print without accessing a network. Easily print from a variety of smartphones and tablets. Your pages come out great?even if you're not there. Access coloring pages, recipes, coupons, and more with free HP Printables - delivered on your schedule. No need to wait - start printing right away with easy setup. Automatically connect to your wireless network. Print in any room you choose - without causing disruptions. Optional quiet mode helps keep noise to a minimum. Mobile Printing Capability: Features wireless direct and local Wi-Fi connectivity to enable mobile printing via HP ePrint, Apple AirPrint as well as other solutions; Mopria-certified. Supports printing from most smartphones and tablets using these operating systems: Android, iOS, Blackberry, Symbian, Windows 8, Windows RT. 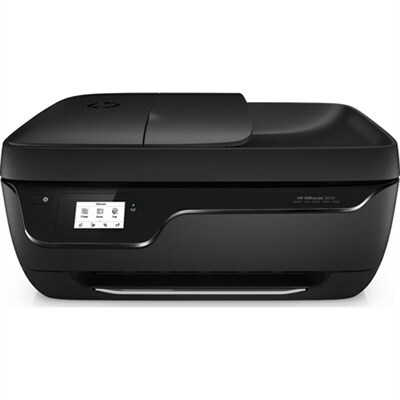 What's in the Box: HP OfficeJet 3830 All-in-One Printer; HP 63 Black Instant Ink Ready Cartridge (~190 pages); HP 63 Tri-color Instant Ink Ready Cartridge (~165 pages); Software CD; Setup Poster; Power cord; Phone cord. Minimum System Requirements PC: Microsoft Windows 8.1, 8, 7: 1 GHz 32-bit (x86) or 64-bit (x64) processor, 2 GB available hard disk space, CD-ROM/DVD drive or Internet connection, USB port, Microsoft Internet Explorer. Windows Vista: 800 MHz 32-bit (x86) or 64-bit (x64) processor, 2 GB available hard disk space, CD-ROM/DVD drive or Internet connection, USB port, Microsoft Internet Explorer 8. Windows XP SP3 or higher (32-bit only): any Intel Pentium II, Celeron or 233 MHz compatible processor ,850 MB available hard disk space, CD-ROM/DVD drive or Internet connection, USB port, Microsoft Internet Explorer 8.